SIGforum.com Main Page Ammunition PSA - Even good ammo goes bad sometimes. I was doing some Mini-14 accuracy testing with multiple types of ammo and had a failure to chamber. The round was about 80% chambered and the op rod was stuck tight. I ended up having to mortar the rifle and was able to eject the stuck round. After checking the barrel I couldn't find anything wrong so I continued shooting. When I was collecting my brass I found the defective round and was able to determine which brand of ammo had the malfunction. I'm not sounding the alarm because I have yet to contact the manufacturer. The ammunition in question is commercially remanufactured and the headstamp is WCC 04 with the NATO cross, which leads me to wonder which 5.56 weapon this round was cycled through. A while back there were some case seperation issues with commercially reloaded brass that was traced back to M249 use, so I'm wondering if this was the same thing, Anyway, pics of the round in question. I’m not sure I understood what happened. Was the separated part of the one case jammed onto the complete round? I.e., the previous case separated and left the front section in the chamber? I wouldn’t necessarily agree that this incident is about “good” ammunition. Every firearms manufacturer I’m aware of cautions against using reloaded or “remanufactured” ammunition, and for reasons like this. Commercial reloaders can’t inspect the cases as well as might be necessary and their sources of supply are likely to be quite varied. The vast majority of ammunition problems I’ve seen in training courses have been with remanufactured stuff. And although I don’t know anything about your situation, something I’d recommend to other readers of this thread is that if we have a stoppage serious enough to lock up the gun, we should stop and try to determine what happened, including examining the offending round before continuing to shoot the same stuff. Para doesn't want people using the forum to bash manufacturers so I don't want to say who made the ammo until I'm able to talk to them. The strange thing is they have no e-mail contact on their web site so I have to wait until Monday to call them. What I will say is they are a major player in the new and remanufactured ammo business, and I've been shooting their ammo for over a decade with zero issues. That is exactly what happened. The defective case separated upon extraction and the next round hung up on what was left in the chamber. I bought a 30 cal can of gunshow reloads in 556 at an estate sale. Work great in both of my Colts. Tried them in my Sig M400, every one sticks hard and fast. Had a helluva time getting them out, mortaring didn't work. I really do not like to knock live rounds out of the barrel from the muzzle. Marked the can, will shoot them up in one of the Colts. You can see a pot gut just above the head, and all of them seem to have it. Live and learn. Thankfully the ammo in question is target use only. Ok, problem solved. 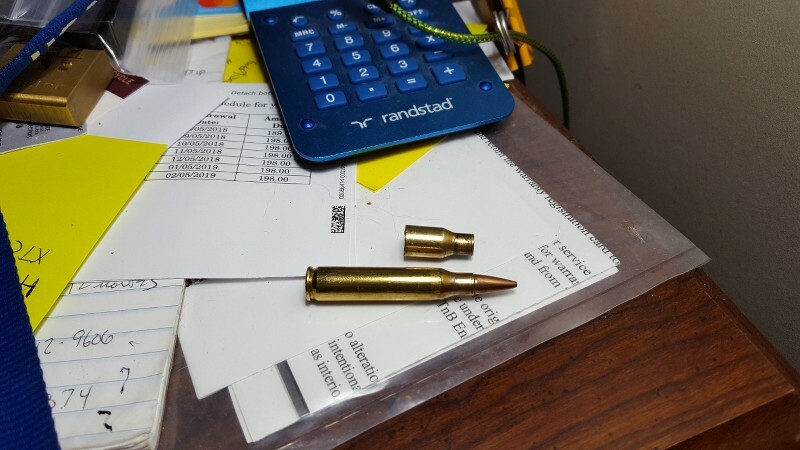 I feel I can safely reveal that the ammo in question is Black Hills blue box 75gr remanufactured. BH verified that my suspicion about M249 brass was accurate, and they are replacing my remaining stash with new blue box. If any company would do right, I would expect it to be Black Hills, so good on that. I wonder how they know, though, what gun(s) the brass they use for the reman ammunition was fired in. On the subject, how accurate do you find that particular 75 grain load to be? Out of my two stainless barrels it's a sub MOA load at 100 yards. One barrel is a Douglas, the other is a Wilson, both are 1\8 twist. The ammo in question was made in 2007. 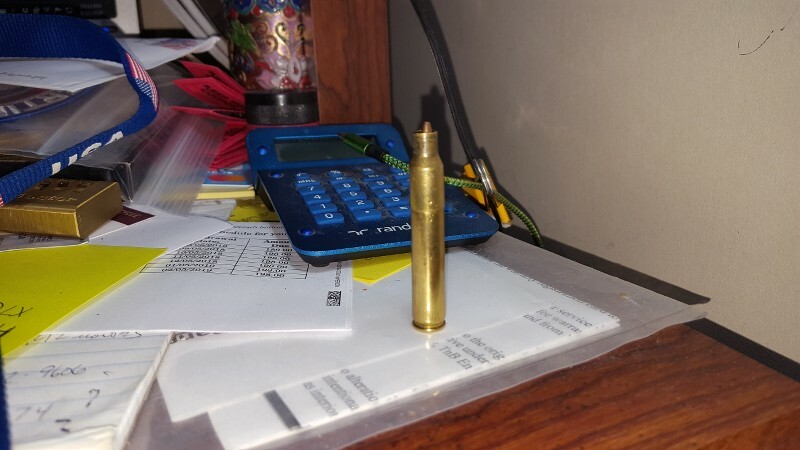 With high optempo in Iraq and Afghanistan there was a shortage of good once fired rifle brass. Many commercial reloaders used whatever they could get their hands on, and the bottom of the barrel is brass from an M249. It's more of a right time\right place association as there is no difference in what type of US NATO headstamp 5.56 gets used in what weapon. What they did say is they see about 10 of these types of ammo malfunctions per year with the blue box ammo. Quick Reply to: PSA - Even good ammo goes bad sometimes.